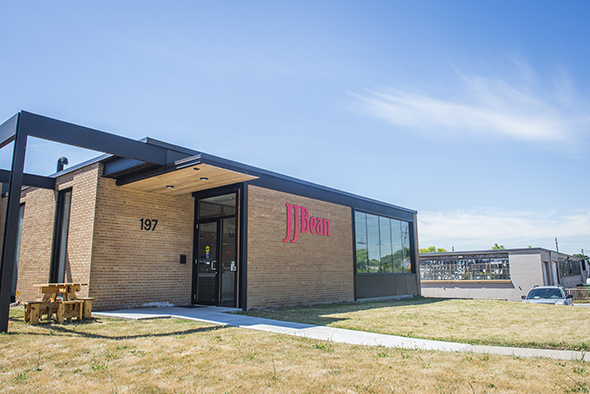 JJ Bean Coffee Roasters, a popular chain of cafes in Vancouver, has opened its first Toronto location in an industrial part of East York. 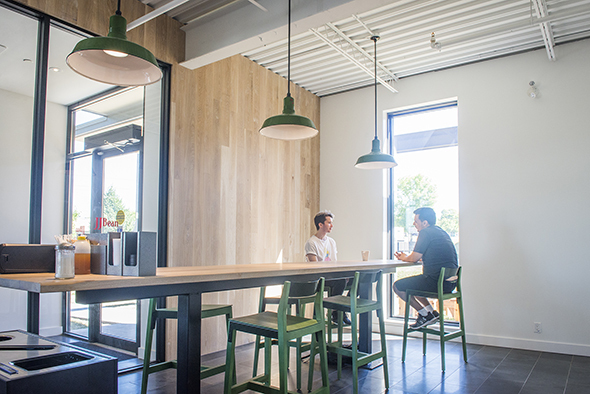 Occupying a large building that's a little over 12,000 square feet in size, this space serves as the company's Ontario head office, housing its roastery, cupping room and bakery in addition to the cafe. 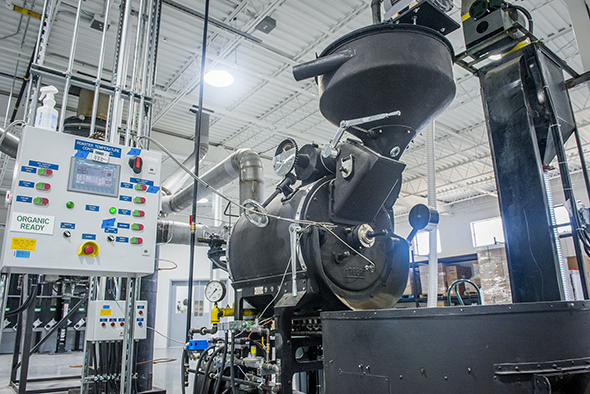 John Neate Jr. (the "JJ" in "JJ Bean," and its founder) and his family have been roasting coffee in Vancouver for four generations. 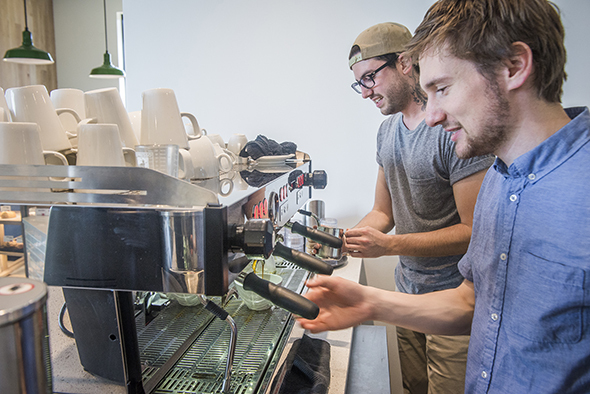 JJ Bean aims to serve the freshest coffee possible, roasting small batches daily. Its motto is "the best taste wins," with a certified Q Grader on staff, performing blind cuppings and scoring green coffee beans weekly. At this cafe, which is only open on weekdays, the offerings are very much consistent with those in Vancouver. There are always four blends available (Espresso JJ, Eastside, Railtown and Decaf, the latter three certified organic) along with a few seasonal single origins that are prepared with French press, which they believe is the best way to replicate what's tasted in the cupping room. 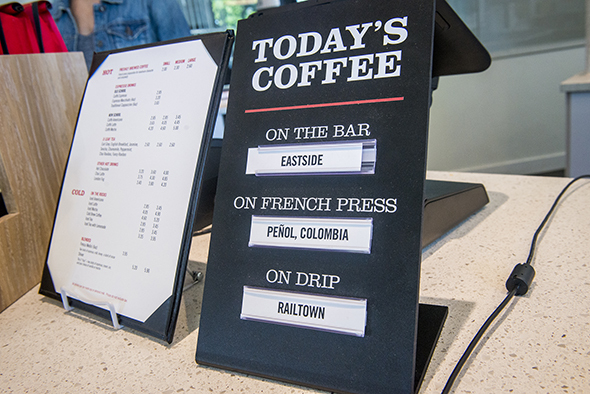 Brewed coffee ($2-$2.60) and "new school" espresso-based beverages (Americano, $2.85-$3.45; latte, $3.65-$4.45; mocha, $4.20-$5) come in three sizes while "old school" drinks (espresso, $2.85; macchiato, $3.20; cappuccino, $3.65) are one size fits all. Of course, all the beans used here are roasted on site in the back. 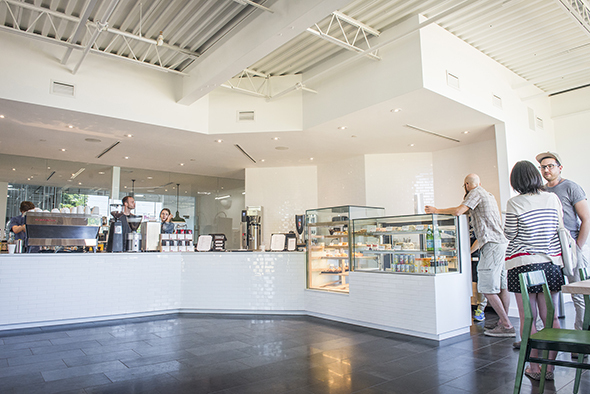 On the wholesale front, JJ Bean's coffee is served at Joey Restaurants and 5 Elements cafe in Yorkville. Loose leaf teas ($2.60 each) are custom made through a private label, and Toronto's Village Juicery supplies cold-pressed juice. I try a carefully made cappuccino that uses Hewitt's 3% milk for the glossy microfoam top. It's certainly on par with the best Toronto has to offer. Baked goods are almost all made in house daily, with the eventual goal to do their own bread as well. 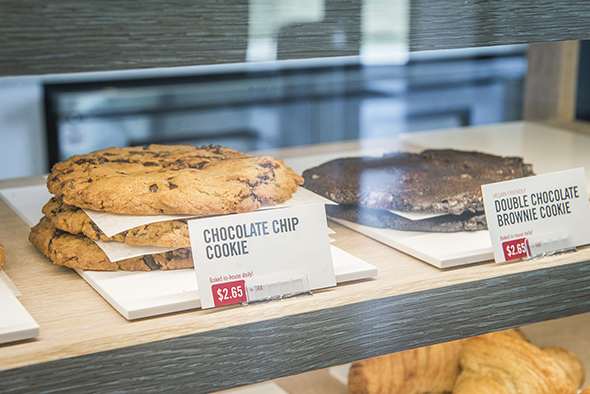 There are some gluten-free- and vegan-friendly eats like muffins ($2.70 each) and wraps ($7.65 for the Casablanca), plus scones ($3.55 each), cookies ($2.65 each) and sandwiches ($6.90-$8.65) for those without dietary restrictions. 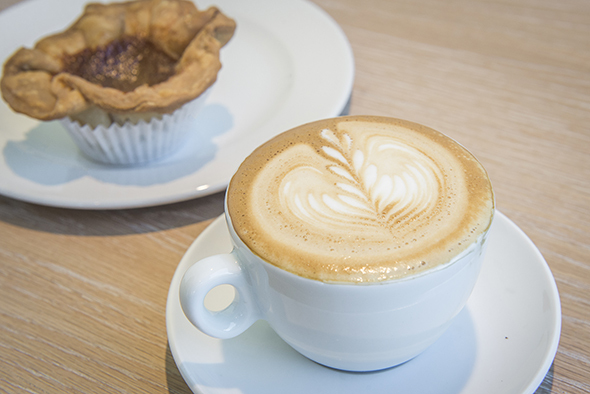 We get a butter croissant ($2.95) and a butter tart ($2.95) to go with our caffeine. 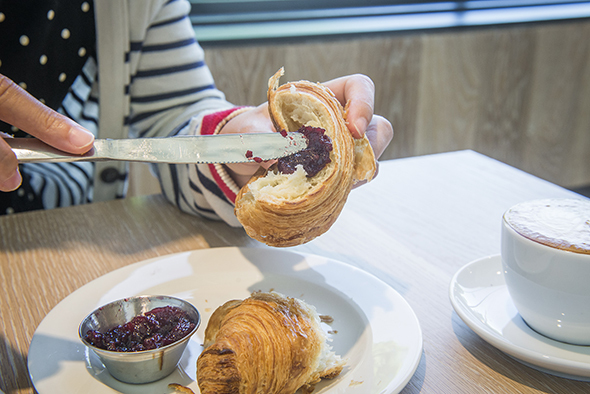 The croissant is incredibly flaky and delicious, and you can definitely tell it's fresh. The butter tart, which is supposedly JJ's favourite, has a hand-formed, rustic-looking pastry crust, and it's oozing with a sweet and gooey filling that includes raisins. Every JJ Bean cafe has its own look; I'm told they're designed to suit their surroundings as opposed to forcing a cookie-cutter template on differing areas and neighbourhoods. This location is rather minimalist and industrial-looking, which does fit in with its surrounds. Photos by Hector Vasquez .